Interact with visitors to your website in real-time! Live Agent Chat allows you to monitor visitors to your website and start a dialog with them- answering their questions, building trust and increasing the opportunity for new sales! Chat with people who visit your website! See the floating Live Agent icon on this page? 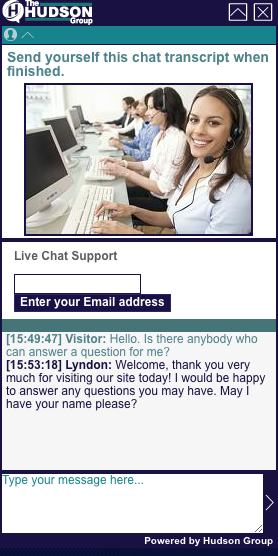 This is the Hudson Live Agent Chat interface in action. When staff at our company are online, they can see you interacting with the pages of our website and can monitor you as you navigate through our content, ready to answer any questions or concerns you might have for us. If you click the floating icon, you can open a chatbox and begin interacting with Hudson support, business development, accounting, or management in real-time! This is a stand-alone product offered by The Hudson Group that allows you to monitor visitors to your company website and then interact with them one-on-one. You probably use social media and other marketing efforts in order to get your website address into the hands of your customers and prospects. Assuming your efforts are successful and somebody lands on your website, what happens then? Most likely, a person browses a few pages of your site, reviewing information about your company's products and services. If there is nothing to grab their attention, they leave the site and move on. With Hudson's Live Agent chat, you can see somebody on your site and proactively open a chatbox on their screen, welcome them to your website and invite them to ask questions. This changes the web browsing experience from passive to interactive. You now have the opportunity to engage your visitors and increase the chance of them doing business with you! As mentioned above, the Hudson Live Agent chat system allows you to monitor real-time activity on your website. It also shows you how long they have been on the site, and what other external links, search engines, and keywords brought them to you. These tools allow you to track the results of your marketing efforts and manage your website content for maximum effectiveness. The Live Agent chat system by Hudson is not only for your clients and prospects, but also for your internal company staff as well. It offers the ability to interact across different business locations with real time messaging, all without having to pick up the phone. And while we're talking about phones... generally, your staff can only handle one telephone call at a time, whether it's with a client, prospect or other company employee. The Live Agent chat system allows an individual to have multiple chat conversations going simultaneously, greatly increasing communication efficiency. The reports and statistics in the Live Agent Chat system let you go back in time and review chat activity and history, and export data.